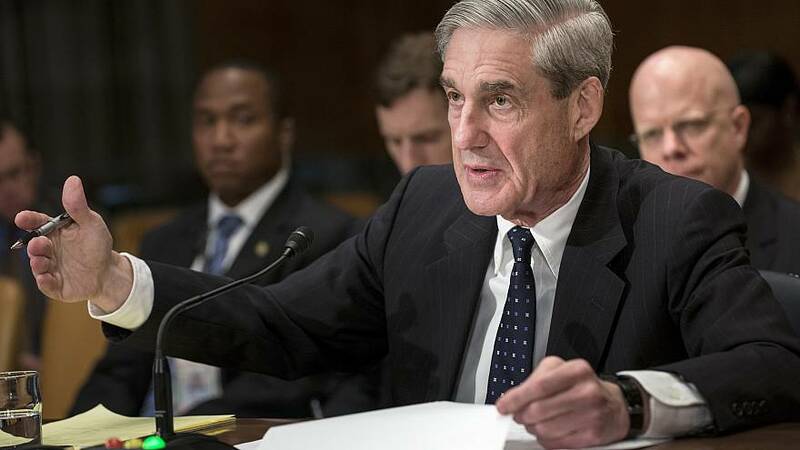 WASHINGTON — After the tax legislation finally cleared Congress Wednesday, and with the races of 2017 fully behind us, the biggest political story in America turns back to the Russia probe. And according to the new NBC/WSJ poll released this week, Americans are split on its severity, with 38 percent saying the 2016 Trump campaign DID collude or work secretly with Russia, and with 35 percent saying it didn't. Another 26 percent say they don't know enough to say. Not surprisingly, there's a significant partisan divide to these numbers. Sixty-five percent of Democrats in poll say the Trump campaign colluded, versus just 6 percent of Republicans who agree. Independents are pretty much split down the middle, with 38 percent saying the Trump campaign DID NOT collude, compared with 35 percent who say it did. When respondents in the NBC/WSJ poll were told that four members of Trump's team have been indicted or have pleaded guilty as part of the Russia probe, 28 percent said these indictments/guilty pleas were just about wrongdoing by these individuals. But 36 percent say they suggest potential wrongdoing by President Trump. Another 34 percent don't know enough to say. Those one-quarter to one-third of Americans who don't know enough to say on these two questions could be very important politically in the coming months ahead on the Russia story. Meanwhile, Attorney General Jeff Sessions has asked his Justice Department to take a fresh look at that Uranium One deal, NBC's Tom Winter, Pete Williams and Ken Dilanian write. "On the orders of Attorney General Jeff Sessions, Justice Department prosecutors have begun asking FBI agents to explain the evidence they found in a now dormant criminal investigation into a controversial uranium deal that critics have linked to Bill and Hillary Clinton, multiple law enforcement officials told NBC News." "The interviews with FBI agents are part of the Justice Department's effort to fulfill a promise an assistant attorney general made to Congress last month to examine whether a special counsel was warranted to look into what has become known as the Uranium One deal, a senior Justice Department official said." It's unclear if this is just Sessions going through the motions of the ask that congressional Republicans earlier made, or if this suggests a serious move. At 10:00 am ET, the UN General Assembly will begin open debate on a resolution against the recent U.S. decision to recognize Jerusalem as Israel's capital and eventually relocate the U.S. embassy, per NBC's Andrea Mitchell and Abigail Williams. And the vote comes after President Trump threatened countries that might support the resolution. The New York Times: "Mr. Trump's statement … followed a letter to General Assembly members from the American ambassador to the United Nations, Nikki R. Haley, in which she warned that the United States would take note of countries that voted in favor of the measure. 'All of these nations that take our money and then they vote against us at the Security Council or they vote against us, potentially, at the Assembly, they take hundreds of millions of dollars and even billions of dollars and then they vote against us,' Mr. Trump said." "'Well, we're watching those votes,' he added. 'Let them vote against us; we'll save a lot. We don't care.' It is difficult to see how Mr. Trump can make good on that threat because it could involve cutting off financial assistance to the country's most strategic allies in the Middle East. Some of those programs, like Egypt's, are congressionally mandated. While the president can hold up aid unilaterally as a form of leverage, canceling it would require new legislation." "Trump, who said he would be a 'big loser' if the bill passed, stands to gain immensely from the Republican tax overhaul, including through a lower top tax rate and lucrative deductions for top-earning households, according to attorneys and tax experts who reviewed the final bill," the Washington Post writes. "Trump could also take advantage of benefits that will lift specific business sectors, including a last-minute tax deduction that helps many owners of high-value commercial real estate, the industry where he first made his fortune." More from the Post: "The Republicans' first legislative triumph of 2017 will ensure a financial windfall for the president and his family in a way that is virtually unprecedented in American political history, experts said. 'I'm not even aware of a single provision in the bill that disadvantages him or his family, other than the change to state and local tax deductibility,' said Daniel Shaviro, a tax professor at the New York University School of Law who worked for Congress's Joint Committee on Taxation during the country's last major tax overhaul in 1986. "It's so clear that he is financially much better off than previously," Shaviro said, adding, 'I'd be at a loss as to how they could even dare to argue' otherwise." NBC's Maggie Fox: "Nearly 2 million children will lose health coverage starting next month if Congress doesn't renew funding for the Children's Health Insurance Program (CHIP) by Friday, a new report projects. Already, state CHIP administrators say, parents are panicking and permanent damage has been done to the program, set up to take care of kids who don't have health insurance through other programs." "CHIP covers 9 million children across the country. Congress failed to authorize funding in September, and some states have already started warning parents to get their last medical visits in while money lasts." A day after a Democrat Shelly Simonds appeared to a win a recount by a single vote, ending Republican control of the Virginia House of Delegates, the race now appears headed for a literal DRAW or COIN FLIP to determine who wins. Republican incumbent David Yancey picked up an additional vote Wednesday, which means the race is now TIED at 11,608 votes each. And the winner will be determined by a coin flip or blind draw out of a container. The date for that has not yet been set.